Take a look at the three different levels of home care. Monitoring is the lowest level of care. Seniors who are pretty independent but could use help with more difficult tasks like running errands and transportation to appointments are the right candidates for monitoring. Monitoring can also offer companionship to seniors, giving them someone to talk to for a few hours a week. Seniors who need some help around the house should consider homemaking care. The home care services that are included on this level can be anything from making meals to housekeeping duties. Personal care for elderly people is often around-the-clock since it's the highest level of care. 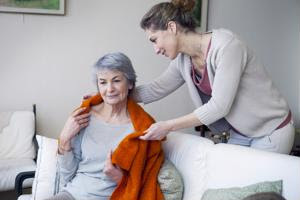 Personal care providers take care of monitoring and homemaking responsibilities, but they also help with personal tasks like bathing, dressing and feeding.